As I thought about ideas for Winnie’s birthday cake, I remembered that she drinks two Caramel Macchiato’s a day. Two! Yes, she mentioned how expensive it was getting. The thing is, I’ve never had a Caramel Macchiato. I don’t like my espresso drinks very sweet and that one just sounds like it would be. So, this cupcake is really inspired by the description I read of a Caramel Macchiato, more than my experience of one, but it turns out, Winnie thought it tasted quite like one and she is the expert. As an added touch, I wanted to make the coffee flavored cake stronger on the bottom, lighter on top, an effect that happens in espresso drinks as the frothy milk is mixed in. 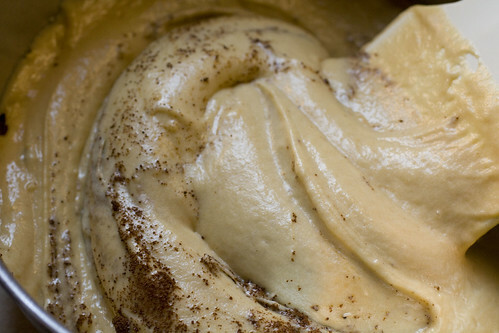 My way of doing that is to make the coffee cake batter and divide it in half, adding espresso powder to one half, and using the stronger half on the bottom, the lighter half on top. It is a little extra work but it’s subtle things like this that show extra care and love. (It’s not quite as visible as I had hoped for but you can taste a difference.) 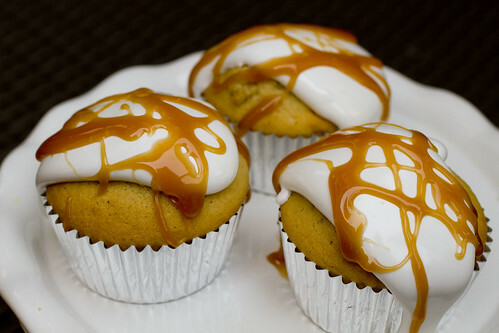 The cupcake is topped with fluffy meringue and drizzled with caramel, rounding out the flavors quite perfectly. 1. 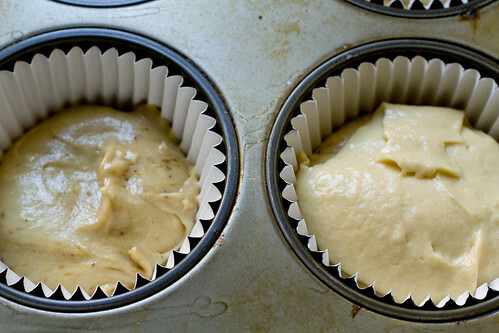 Place rack in the middle of the oven and preheat to 350 degrees F.Place paper liners in muffin tin. 2. Stir together flour, baking powder, and salt in a small bowl and set aside. Combine coffee, milk, and Kahlua in a cup and set aside. 3. Cream butter and sugar together in the stand mixer (with the paddle attachment) on medium speed, until light and fluffy, about 5 minutes. Beat yolks in one at a time. 4. Reduce speed to low and beat in one-third of the flour mixture, then half of the liquid mixture. Scrape down sides, then beat in another third of flour mixture, then the rest of the liquid, then the remaining flour mixture. Scrape down the bowl and divide batter in half. 5. Leave half of batter as is. Stir instant espresso into the other half. 7. Bake for 15-18 minutes or until toothpick comes out clean. Allow to cool in the pan for 10 minutes, before removing them to a wire rack. Cool completely before frosting. 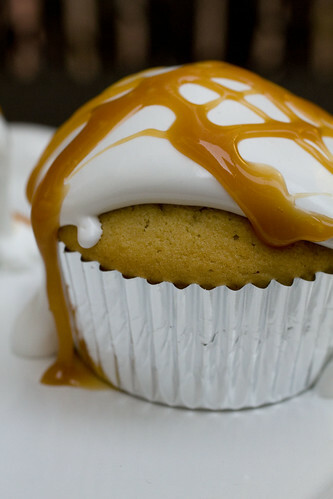 *Don’t make meringue until cupcakes have cooled. *Making a small amount of caramel is a little more challenging because you have a smaller window of caramelized sugar to burnt. Make sure everything is ready by the stove before starting. Spread sugar evenly across the bottom of a heavy bottomed saucepot and put over medium-high flame. Try not to touch the sugar but watch carefully as it melts. As soon as it is browning, you can start to stir. When it looks like all of it has browned lightly, remove the pot from heat and stir in butter. Be careful because it will bubble violently. Bring it back to the flame and stir for a few seconds until smooth. Remove from the heat again and add heavy cream, again careful of violent bubbling. Stir rapidly until smooth. Set aside and allow to cool to luke warm. 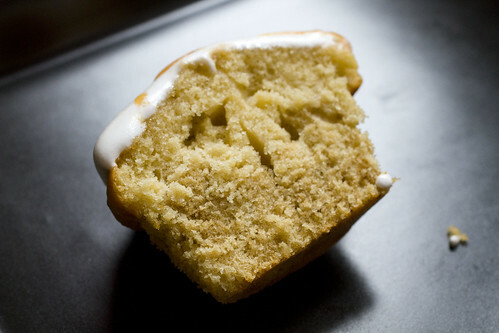 You can make the cake part a day before and store in airtight containers after they have cooled. 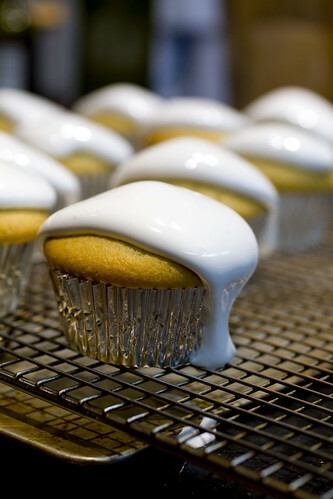 Once you make the icing you have to plop it on the cupcakes immediately, but once cupcakes have been completely assembled, they can be held in room temperature for several hours before service. 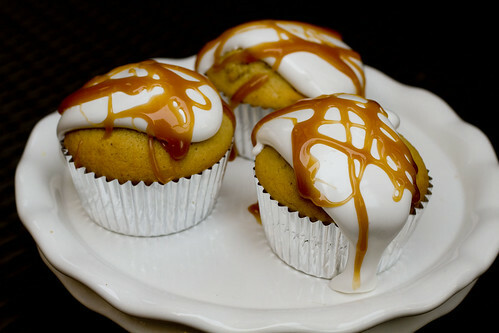 posted by jessica	at 10:39 AM	Filed under Desserts, Recipes. You can follow any responses to this entry through the RSS 2.0 feed. Both comments and pings are currently closed. 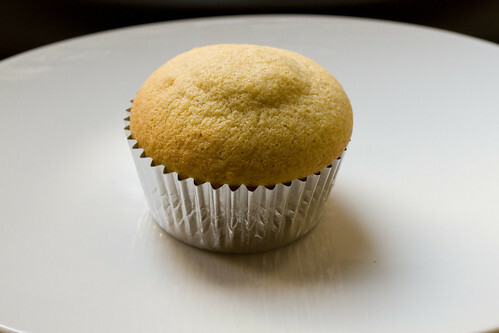 Hi, I’ve just tried to bake these cupcakes and the cupcakes itself came out perfect. The problem was that my icing was too stiff so the aesthetics weren’t that great. Could you explain how I may get the runny meringue icing in greater detail?